At the age of twenty-two, William, Duke of Normandy’s thoughts turned to marriage. He chose Matilda, the Count of Flanders’ daughter and the King of France’s niece. However, their degree of kinship, considered too close, led to opposition from the Pope Leo IX who forbade their marriage. Lanfranc, prior of the Bec-Hellouin Abbey and one of the duke’s advisers, was to plead their cause before the Pope who finally accepted their marriage in exchange for the construction of two abbeys in Caen: The Men’s Abbey (Saint Etienne, consecrated in 1077) and the Ladies Abbey (Sainte Trinité, consecrated in 1066). The facade, the nave and the base of the transept are William’s abbey-church’s oldest vestiges: the harmonic facade comprises two symmetrical towers enclosing a central gable. Indeed, it was Saint Etienne de Caen that provided this model, subsequently borrowed and copied throughout Norman Europe. Furthermore, the abbey buildings are a magnificent example of classical architecture dating from the 18th century restoration campaign. Around 1050, William, Duke of Normandy, married Matilda of Flanders. However, due to excessively close kinship, their marriage was disapproved by Pope Leo IX. His successor, Pope Nicholas II, later granted the couple with his pardon, provided they found four hospitals and two abbeys. Matilda of Flanders chose to build the Ladies’ Abbey in Caen, dedicated to the Holy Trinity, whereas her husband founded the Men’s Abbey, dedicated to St. Stephen. William’s wish to be buried in the Men’s Abbey was respected for he was laid to rest there in 1087. The construction of these two abbeys was also a means of securing the Duke’s power over his viscounts. In the Middle Ages, it was commonplace in Normandy to erect monastic buildings to establish one’s authority. The architecture of the Men’s Abbey is typical of Norman Romanesque constructions and was a source of inspiration for many other abbeys in England. The abbey is built over three levels, the harmonic facade boasting two symmetric towers. The ensemble also comprises buildings which once housed Benedictine monks, the Ducal Palace where distinguished guests were welcomed, a cellar, a refectory, a cider press, a bakery and a Guardroom. However, the Hundred Years’ War, then the wars of religion were to take their toll on the site. The buildings, along with William the Conqueror’s grave, were pillaged. The Church choir collapsed and was rebuilt in the 15th century. During the French Revolution, the monks were driven out of the Abbey and the building was used for administrative purposes. In 1804, it housed a boys’ school, named the Lycée Malherbe, a school which has since been moved to more recent buildings. In 1840, the Ducal Palace was home to the École Normale d’Instituteurs (men’s teacher training college) then, from 1887 to 1961, the École Normale des Institutrices (women’s teacher training college). 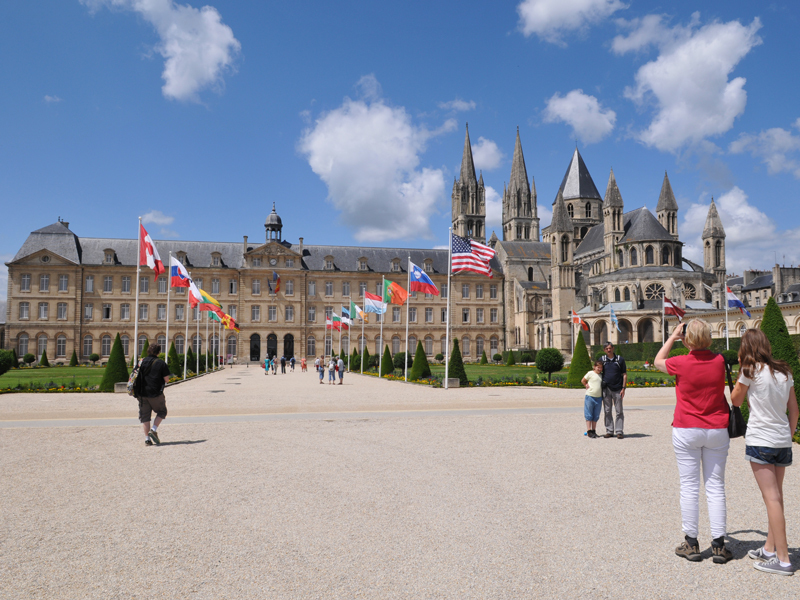 In 1944, during the Second World War, the inhabitants of Caen took refuge within the church and the college to escape the bombardments that almost totally razed the town to the ground. Part of the site was transformed into a makeshift hospital. In 1961, the Caen City Council purchased the entire site. Since January 1965, the Men’s Abbey has served as the Caen City Council’s headquarters and it hosts Council meetings. The former bakery has been transformed into the Museum of Nature. The Ducal Palace now houses the Caen art library and the Salle des Piliers, located on the ground floor, is used as a reception room. Tours of the Men’s Abbey are regularly organised. Départ du hall d’accueil de l’hôtel de ville. Horaire variable selon le circuit (3 circuits possibles) et la saison. Pour les groupes, visites guidées du lundi au vendredi (réservation obligatoire).